OUT NOW: VHS Lives 2! And it's out! 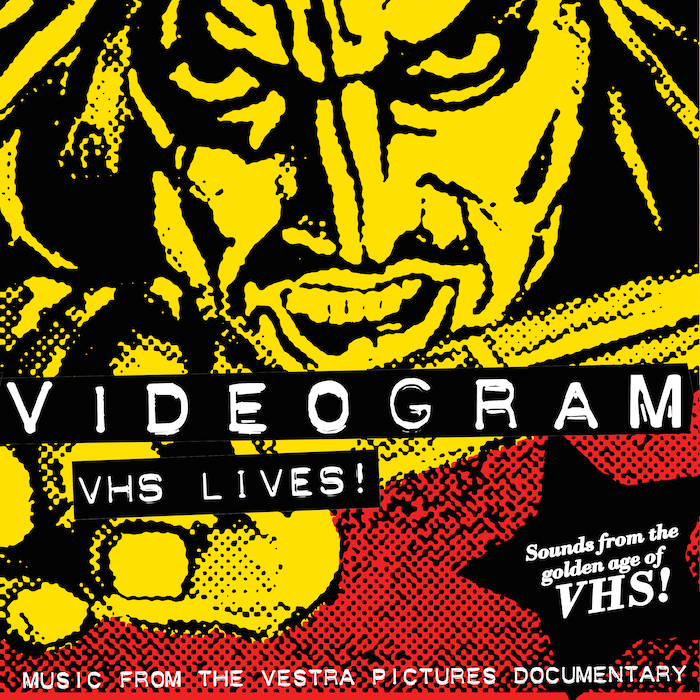 Pretty stoked to announce that WWMD released the VHS Lives 2 documentary on DVD yesterday! Available via WWMD direct here, the DVD is distributed exclusively by MVD Entertainment, so you can buy it at Best Buy, Deep Discount, and TCM Shop, to mention just a few. If you want VOD, you can stream, rent and buy it via Amazon Prime, iTunes, Microsoft, and Vimeo - the latter is U.S. only. Which brings me to the next subject! 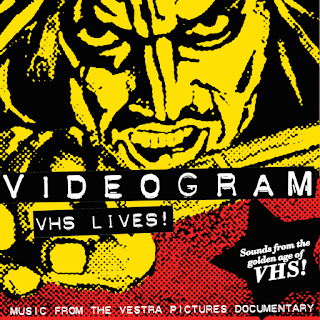 Announced earlier, I'm releasing the Videogram tracks that appears in the documentaries - remixed and remastered! The sleeve has been updated with artwork that I felt was more fitting, going for an old school xeroxed fanzine aesthetic. Stay tuned for more info! Exciting news! 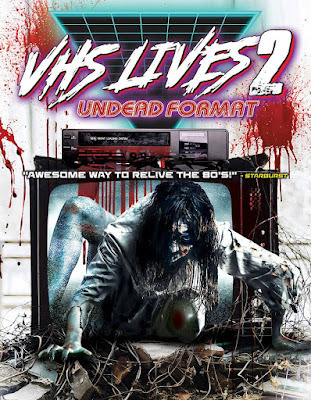 Yesterday MVD Entertainment Group shared photos of the DVD version of Vestra Pictures' documentary VHS Lives 2: Undead Format on their Instagram page. The street date is February 12, with the DVD being available for store orders as of now. The first installment in the series can be found at Target and Forbidden Planet, so it won't be hard to track down. Check it out! 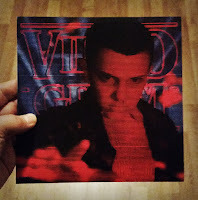 While on the subject, if you got Instagram, you can follow me at https://www.instagram.com/videogramswe/! Here's a mammoth update for the first quarter of 2019! First off, the two-track Gladiatori dell'Apocalisse (edit) digital single, originally released for Groupees.com's California Wildfire Benefit, is now available to stream and download! 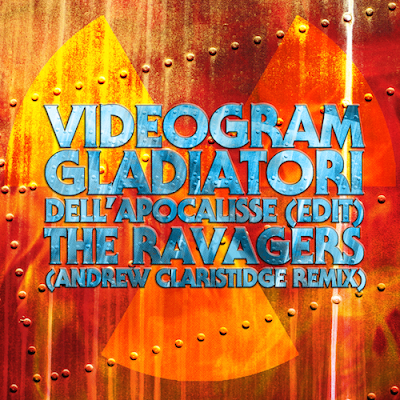 Featuring two previously unreleased tracks, the long-play single sees me revisit and finalize an Italo-flavored outtake from the 2016 Gladiatori dell'Apocalisse 12" EP sessions, with Andrew Claristidge (of Acid Washed) providing a remix of the b side track The Ravagers. Available via Bandcamp and all streaming platforms, teaser video here. Second, the physical version of my six-track EP tribute to John Carpenter's iconic 1982 classic The Thing - Outpost 31 Isn't Responding - is finally available! Originally released in the fall of 2015, the 2018 ’redux’ version saw the digital single completely remixed and remastered, and expanded with session outtakes, one freshly-penned track, plus my reimagining of Ennio Morricone's Humanity Pt. 1 added as bonus tracks! Manufactured on snow-white cassettes with full color A and B side stickers, the "cassingle" comes with a wrap-around sleeve featuring Van Davis' gorgeous original artwork printed on premium recycled card stock. Available via Bandcamp! Teaser videos here and here. 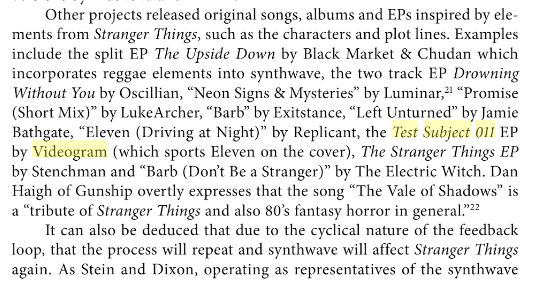 Finally, having received the news that my Test Subject 011 EP is mentioned in Kevin J. Wetmore Jr's book Uncovering Stranger Things, I decided to print up a limited-edition sleeve for the 7" vinyl version to celebrate! The VHS-inspired alternate artwork, featuring Stranger Things character Eleven in an action pose, is printed on 130 gram folded paper stock, comes in a plastic sleeve and is hand numbered to 50 copies! Only available via Bandcamp here, it includes a download of the digital EP version that now adds the alternate mix of Test Subject 011 (from the Choice Cuts 2014 - 2018 album) as a bonus track! 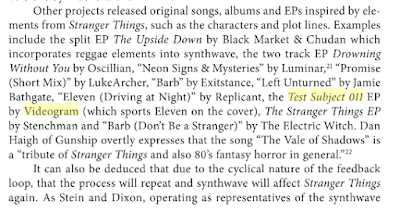 Pleasantly surprised to get the news Videogram and the Test Subject 011 EP being mentioned in Kevin J. Wetmore Jr's book Uncovering Stranger Things: Essays on Eighties Nostalgia, Cynicism and Innocence in the Series! This collection of 23 new essays explores how the show reduces, reuses and recycles '80s pop culture--from the films of Spielberg, Carpenter and Hughes to punk and synthwave music to Dungeons & Dragons--and how it shapes our understanding of the decade through distorted memory. Published by Bloomsbury Publishing, the book is available via Amazon and Target, to mention just a few. Check it out! Make sure to check out Groupees' all-new California Wildfire Benefit Bundle that was launched today. With more than a dozen releases by a wide variety of artists and labels, plus Markosia Enterprises comics, this campaign is a benefit to California wildfire victims. My contribution is a two-track single revisiting the 2016 Gladiatori dell'Apocalisse 12" EP, finalizing and remixing one outtake, with Acid Washed's own Andrew Claristidge providing a remix of The Ravagers. Both tracks are previously unreleased and exclusive to this benefit. The bundle is available for a minimum of $1 with 100% of all sales being donated to the United Way's Southern California Disaster Relief Fund, who will support low-income households whose lives have been affected by the current wildfires in Southern California. Please donate here. EDIT: The Damn Fine Network were kind enough to give both the single and the Groupees benefit campaign a shout-out on the latest episode of the Damn Fine Cast. You can stream it on SoundCloud (below), Stitcher, Libsyn, and iTunes. Check it out. Many thanks to Tony Giles for including me and Jesse Breckon-Thomas' Michael in the 111th episode of the Damn Fine Cast! The episode, which leans on the horror side of things, also includes tracks by maestro John Carpenter (taken from the recent 2018 Halloween), a taste from Colin Stetson's Hereditary score, and two tracks from the Blair Brothers' work for the Netflix horror/thriller Hold the Dark! Italian composer Bruno Nicolai and the iconic Jerry Goldsmith wraps up the 53-minute episode with the former's Morricone-esque tunage for Westworld and the latter's work for the 1976 sci-fi classic Logan's Run - quite fine company indeed! It is the spookiest of seasons so get your thrills on with Groupees' special Halloween-themed Bundle of the Damned! Launching today, the bundle includes game titles from Joystick Knights, Seven Sails, Igrodelsky, comics from Antarctic Press, and tracks culled from my Stranger Things-themed Test Subject 011 EP as well as the all-new Jesse Breckon-Thomas collaboration Michael! For the next two weeks, the bundle is available here for a minimum of $3 - with some of the proceeds benefiting charities. Check it out!